Once upon a time, in a fat away land, lived a family of pigs, whom we shall arbitrarilly name ...THE PIGS. Which reminds me of a joke, that is only funny told in Bahasa Melayu. "Kenapa anak babi, bila jalan ikut mak nya, kepala tunduk?" 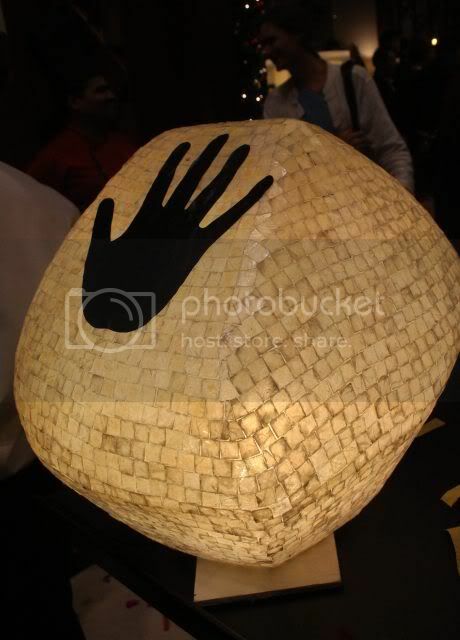 (why is it piglets, when walking behind their mother pig, walk with their heads bowed). Answer: Sebab diorang malu maknya babi. (cos they're ashamed their mother is a pig). You see, pigs aren't abhored in all cultures and religions, in fact, are placed rather highly in some. A pig is one of the animals in the chinese zodiac, right up there with the mighty dragon, and tiger, whilst in Orwell's animal farm, the pigs led the revolution. But I digress from the story of the Pig Family. So yes, we all know the story of the 3 Lil Pigs, and how the two lazy brothers built houses from wood and straw respectively, whilst brother no 3, the over achiever and probably went to Oxford, (like the sausages), built a house of bricks, which prevented them from being eaten by the nemesis, the BIG BAD WOLF. Give the big guy a break, it's in his DNA to eat pig, not salad, so one can HARDLY blame him. Actually, some of our blogging friends are like that too, I might add...it's in our DNA to zero in on the pig. And salads, what a load of tosh. Unlike the Big Bad Wolf, we didn't have to don on sheep's clothing to get our three little pigs. Now in case I have totally confused you, THE THREE LITTLE PIGS AND BIG BAD WOLF is the newest F&B establishment to open in Bangsar Village 1. Located where D'lish, and Country Farm Organics used to be, you really can't miss it if you enter via the open air carpark into BV1. Alternatively you can access it via the Village Grocer. As the name suggests, ....it's everything non kosher. By day, the place is THE THREE LITTLE PIGS, and by night, the place is miraculously transformed to the BIG BAD WOLF, and wine racks that were invisible in the day, appear out of nowhere. What a marvellous idea. 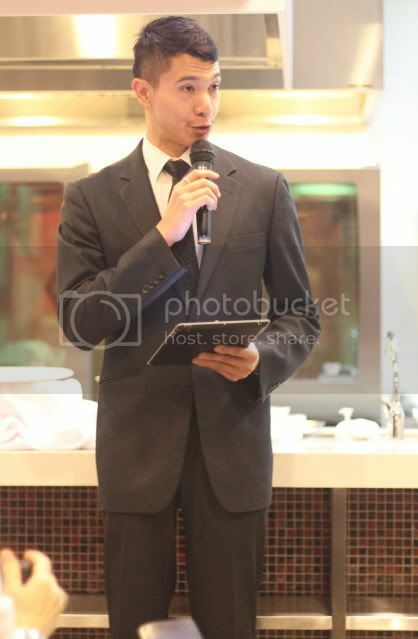 The invitation came from David Choong, part shareholder, and also proprietor of THE MEAT EXPERTS, and we were entertained by the very sweet Inggrid, who is also one of the co-owners. 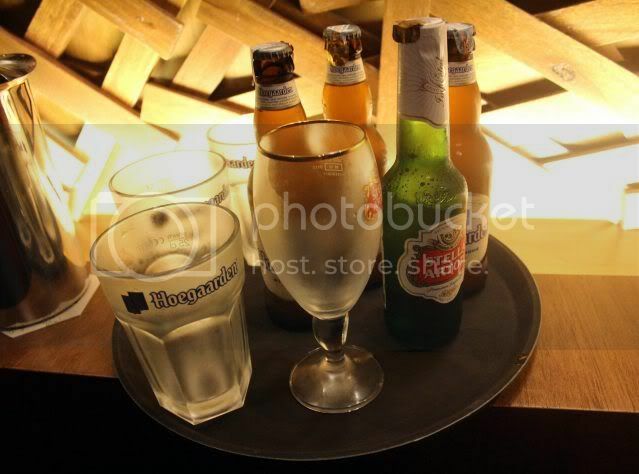 They offer a range of imported beers, like the two shown above, Little Creatures, Crown Lager, etc. 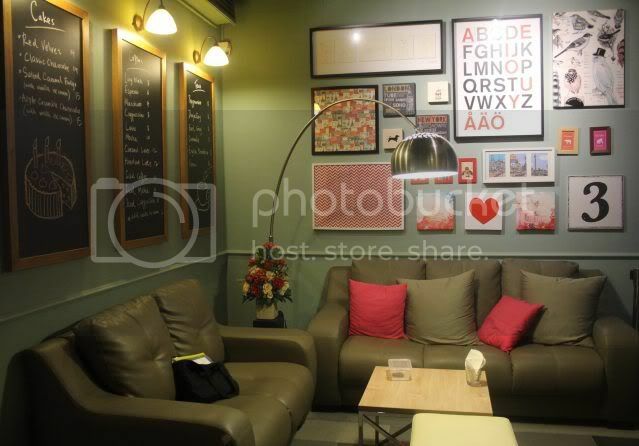 There is a cosy waiting area, which looks like an ideal place to chill and play board games, actually. 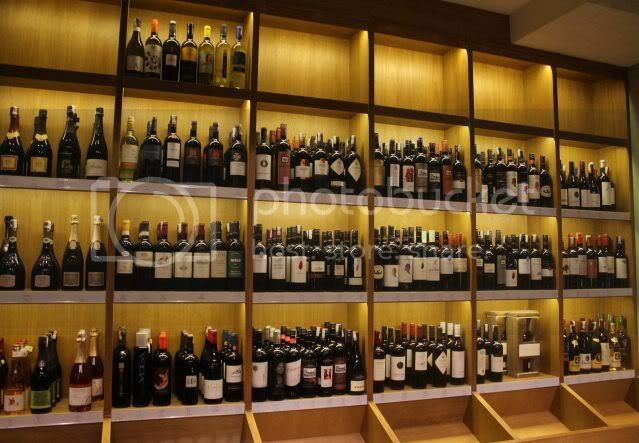 This is the wine area I mentioned, that miraculously disappears in the day, like Dracula. 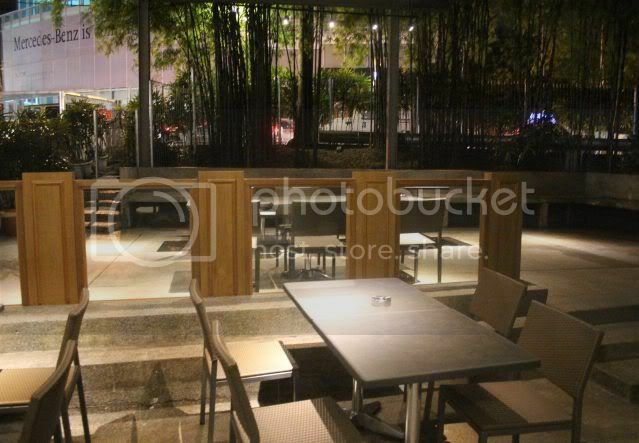 A lovely outdoor area as well, which is ideal for those who huff and puff...and blow the house down. The bar area, and there looks like there's going to be beers on tap, but alas, my favourite dark nectar, guinness, does not seem to be a featured draught. 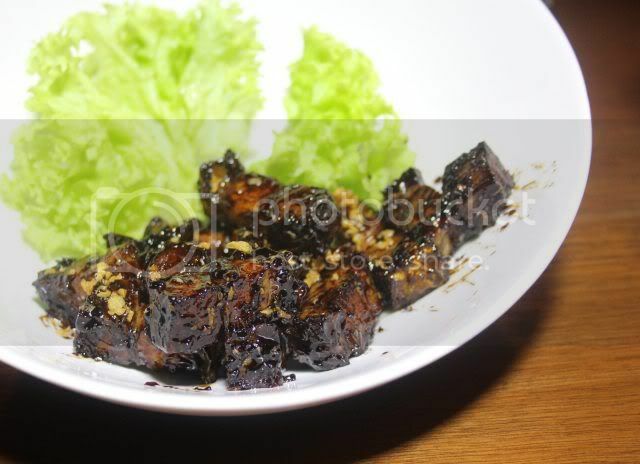 We start off with the Garlic Caramelized Roast Pork, RM15, which is absolutely sinful. Bits of fatty roast pork, (this was probably from the lil pig who made his house from straw, and proceeded to sip martinis by the pool side and never exercised), in a lovely sweetish sauce and generous heap of garlic. Our token non pork starter, garlic mushrooms, which were sauteed just right, leaving a nice crunch still on these white button mushrooms. RM15 for this too. 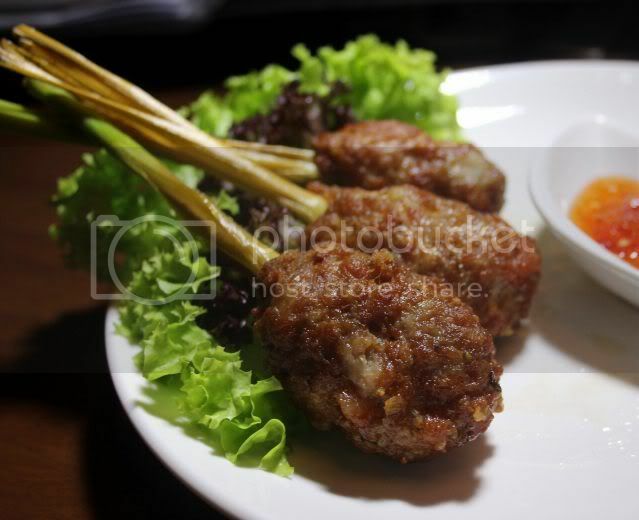 Pork Drumsticks, (no, unlike chicken drumsticks, these are not part of a pig's anatomy, but deconstructed and reconstructed to resemble the fowl version), which are so convenient to eat. Could have done with a little less salt, or the big bad wolf might end up with hypertension. RM13. 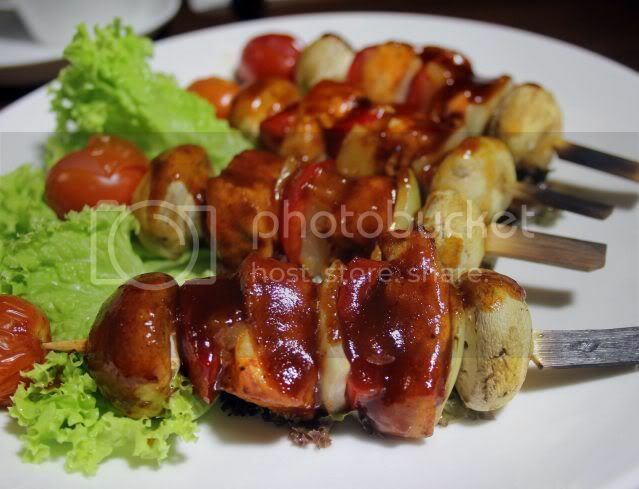 Pork Kebabs, RM22. Not exactly my favourite, because it is adulterated by too many non pork items, such as mushrooms, onions, and tomatoes, making it almost healthy, with a couple of cubes of pork. 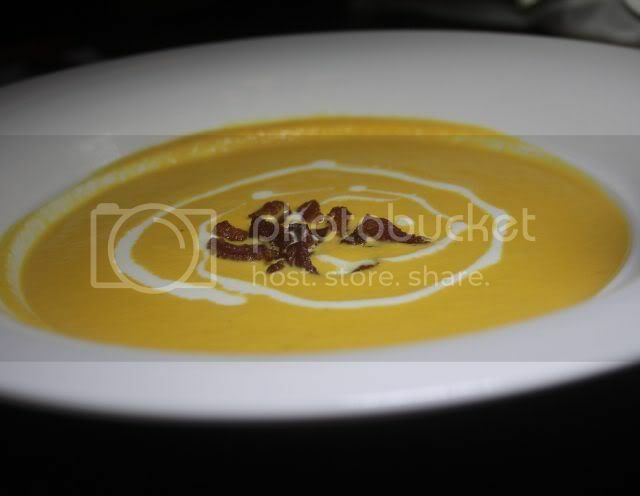 Sweet Carrot Bacon Soup, (RM15) which I swear was a pumpkin in disguise. Delicious, naturally creamy and very easy to drink. Almost wholesome. Now, this is my kind of salad. Bacon, with a hint of greens. 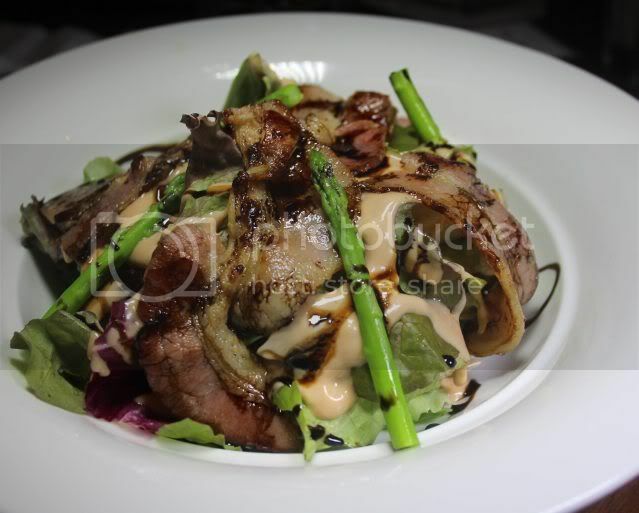 Crispy bacon and asparagus salad, RM22. Absolutely no complaints here, except for the rich dressing, which kind of made it not so healthy. 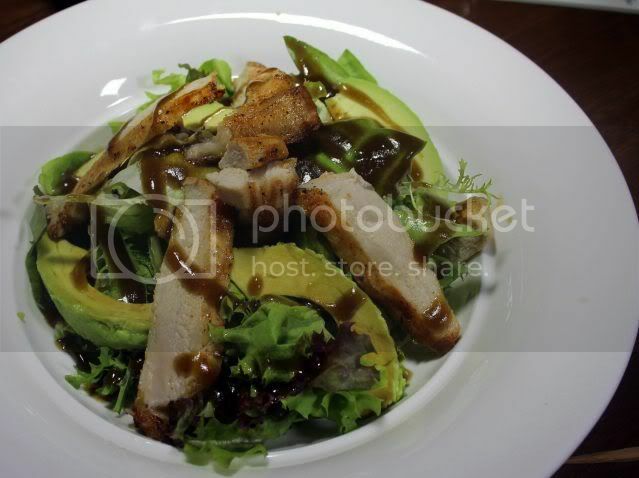 This salad, grilled pork salad, is definitely made from the hardworking overachiever little pig who went to Oxford, and probably spent his spare time working out in the gym. Very lean, and totally not my kind of dish. RM22. Afterall eating lean pork is like eating....Hainanese chicken rice with white rice and no skin. 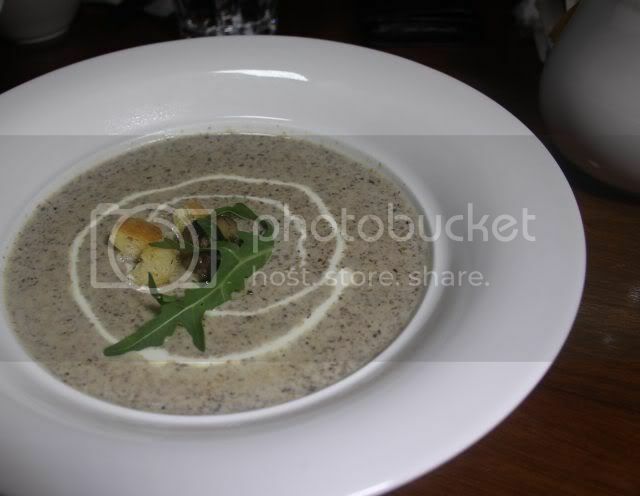 Wild Mushroom Soup. 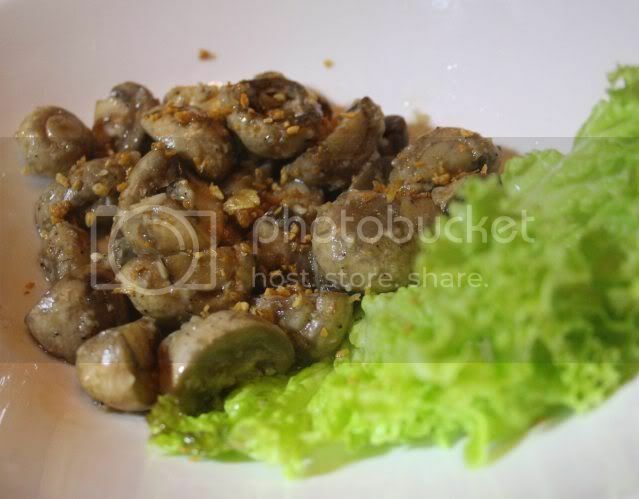 To be HONEST, I don't know if the naming of this dish in establishments all around KL, refers to Wild Mushrooms, or Wild "Mushroom Soup", ..a soup that's wild. I would seriously have my doubts about eating random wild mushrooms, as I heard from a doctor friend of mine in Sydney that mainland Chinese have been harvesting "wild mushrooms" that are neither magical, nor edible, and end up, well, dying, basically. Wild or not, the soup is satisfying and tasty, and for RM15, very reasonable. 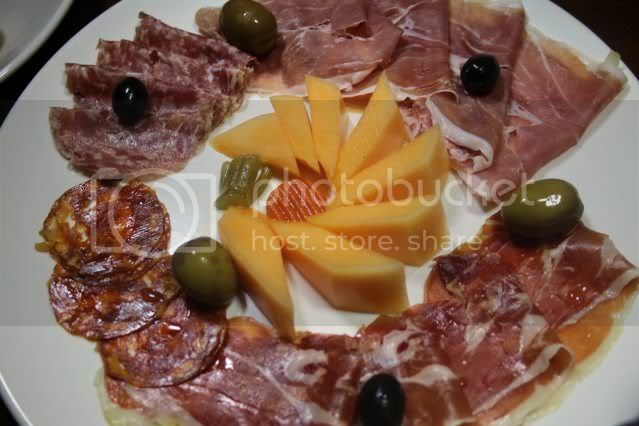 Almost as if an afterthought, we suddenly realised we missed the all important cold cuts platter, RM59, which has parma, serrano, salami, chorizo and olives. Being ever the health conscious one, I single handedly polished off all the olives. After all, olive oil is good for you. 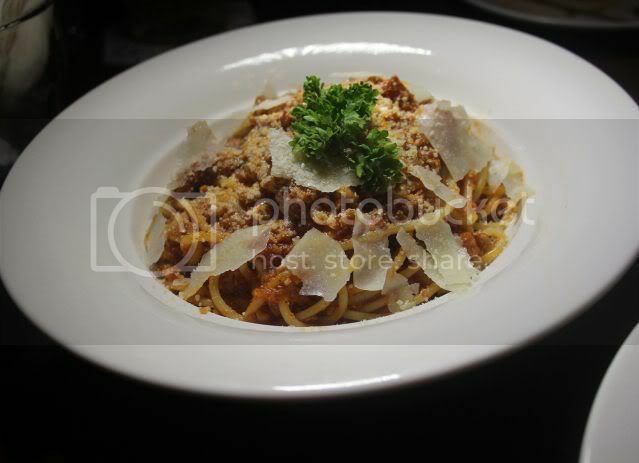 A pasta called Alien Invasion. Well, they're nothing if not imaginative with their nomenclature of dishes. Why Alien Invasion? Well, I have no idea. But if you like creamy meaty cheesy pastas, then this is your dish. Oh, did I say cheesy creamy meaty just then? 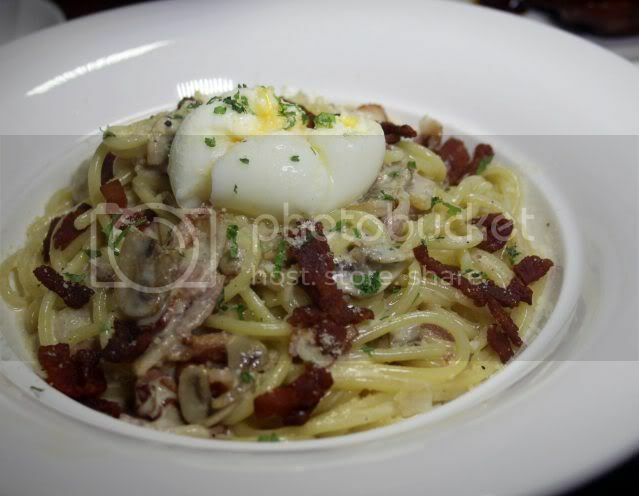 Well, add eggy to this...The Wolf's Favourite, basically a carbonara with a poached egg, with yolks that ooze out. 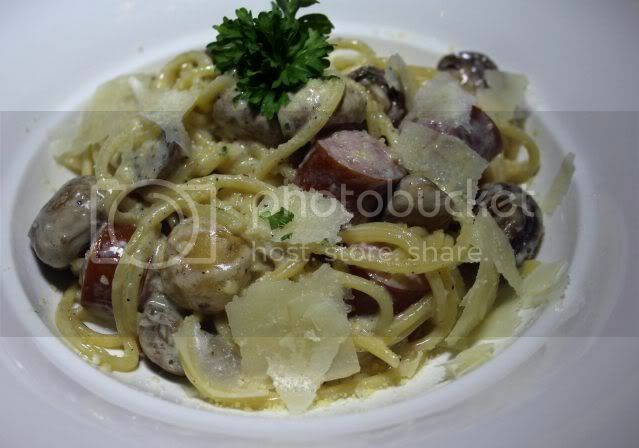 I love these creamy pastas, but could never eat a whole one by myself. Piggy Bolognaise - the least rich of the three we had. I could finish this, I guess. 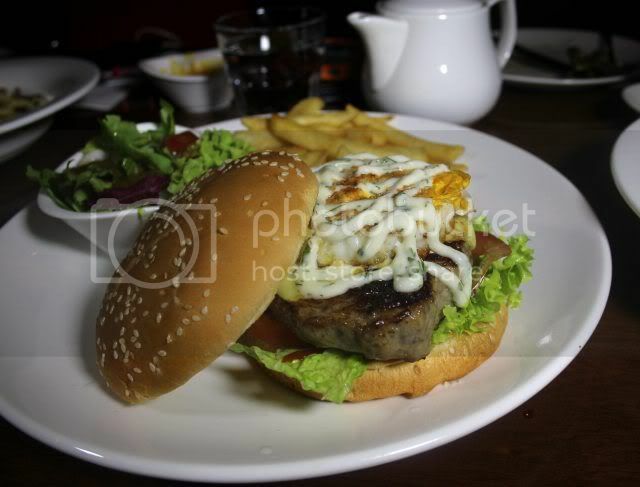 The Mighty Piggy Burger, a yummy pork patty with a fried egg. I think it should be gazetted in Parliament that all burgers MUST come with fried egg. I love burgers with fried eggs. Piggies Rolling In Mud. 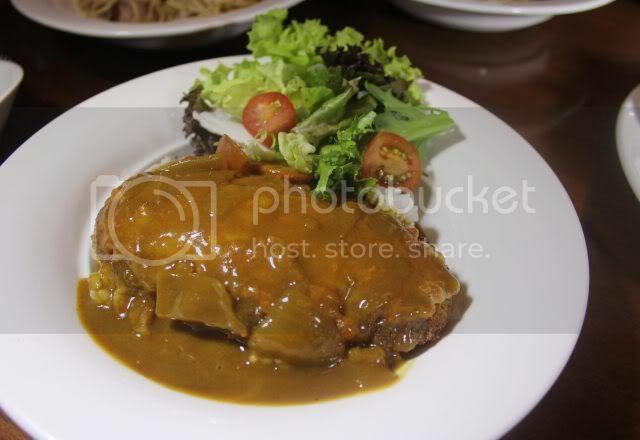 Charming name, but actually a pork chop in Japanese Curry Sauce. Well, unless you're a fan of that Japanese curry, which is sweetish, and thick, ...For me personally, my least favourite. 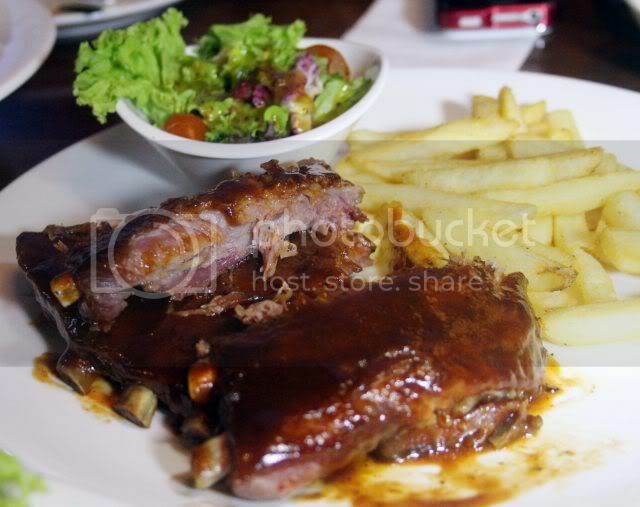 Glazed BBQ Pork Ribs, RM59, tender falling off the bone, in a barbecue sauce that is tangy and sweet. My only comment was that the sides, after being left out awhile, were a bit dry, but the main parts from the bone, when freshly cooked, are absolutely porkilicious. 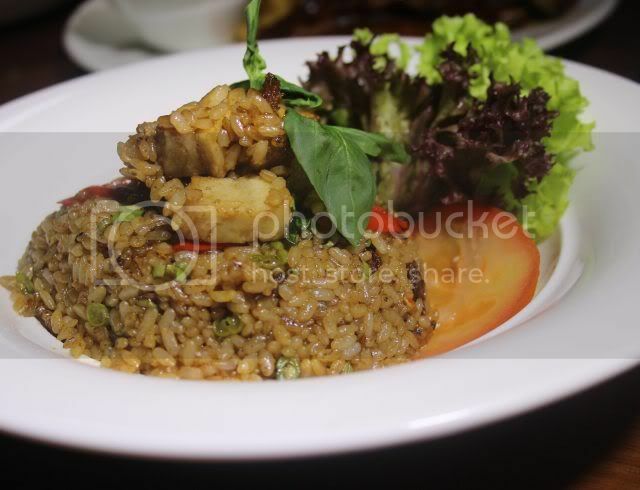 Roast Porky Fried Rice RM19...Yummy, one of my favourites. 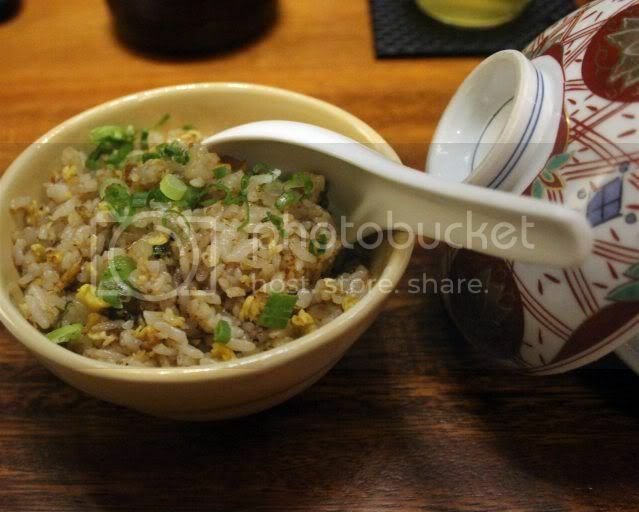 Japanese rice, almost like a risotto, but not as soggy, with lovely chunks of roast pork. 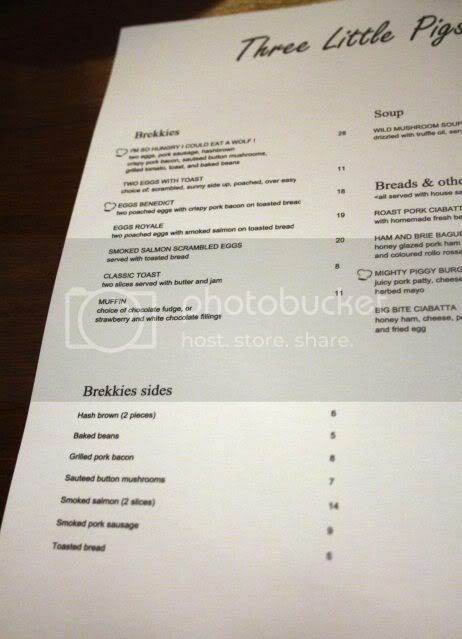 Check out their breakfast menu..... I must come back for this. A post on Facebook solicited a LOT of comments about how sinfully unhealthy this must be. But it's no worse than your regular deep fried stuff I reckon. 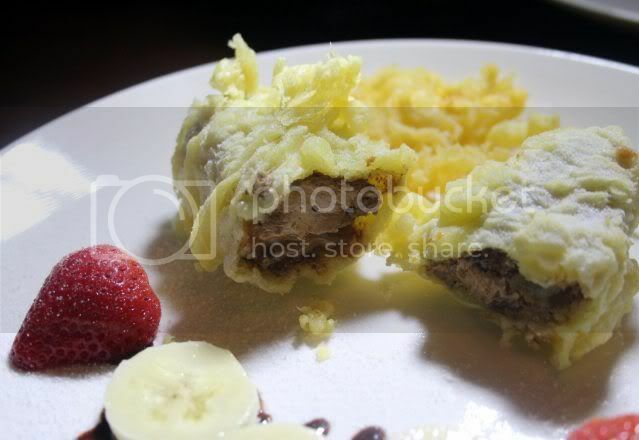 However, to me, its more a novelty than an actual dessert, and taste wise, not my cup of tea. I'm glad I met no wolves on the way back, after being stuff with so much pig. The years just pass by in the blink of an eye. It is always bittersweet retrospection at year end, as we come to a close of yet another year. Every December, I would switch music selection to play Christmas songs, and by the end of December, would be well and truly overdosed. Better that than being overdosed with Christmas rich foods I suppose. While I personally have never really subscribed to the whole Christmas tree thing, I am amazed by the effort people and institutions go through to doll up this humble pine. 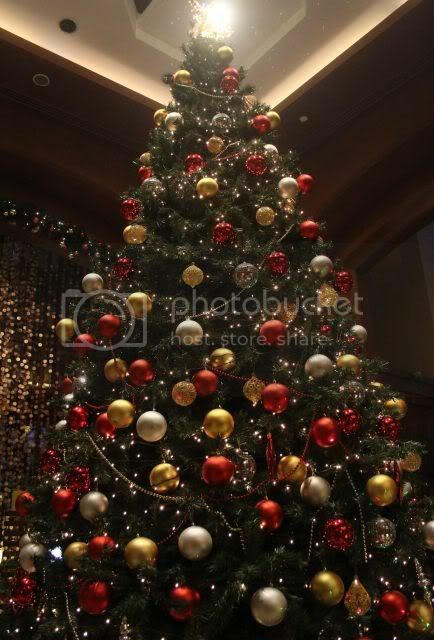 Lest I sound like an old cynic, I have to qualify that there is something festive about the whole tree thing, and I am sure it forms an indelible part of many people's Christmas memories of growing up etc. 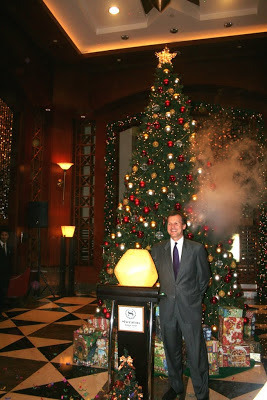 This year, quite a few hotels have had an official lighting of their Christmas trees, and Sheraton Imperial KL was the only one I managed to attend. 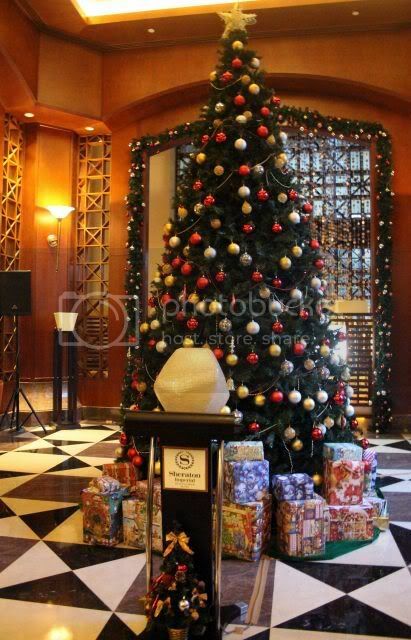 A beautiful tree adorned the lobby area of the hotel, but was yet unlit when I arrived. The unlit tree - waiting to see the light. This contraption is not for the mayor of Gotham to summon Batman, but for the lighting of the Christmas Tree by Hotel Manager, Kurt Vieren and the hotel’s Managing Director, Chuck Abbott. 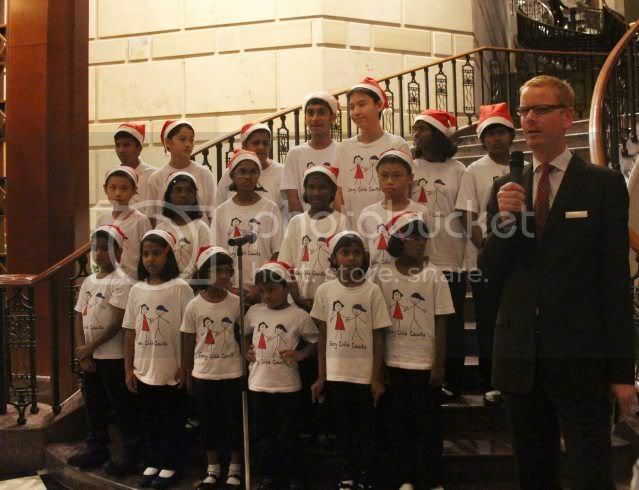 The hotel also invited children of the Lighthouse Children Welfare Home Association to perform beautiful Christmas carols, and I have to say the kids looked so adorable and really gave a beautiful performance. 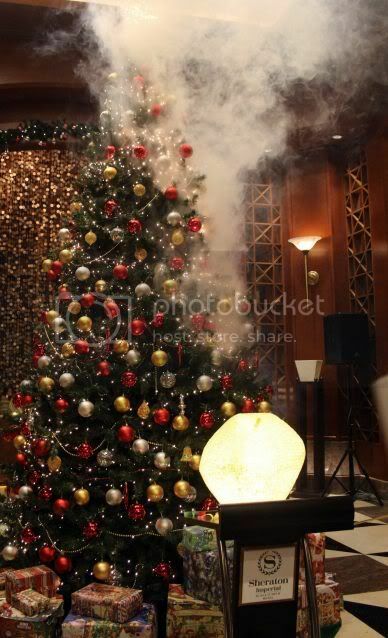 That is one hot sizzling tree!!! 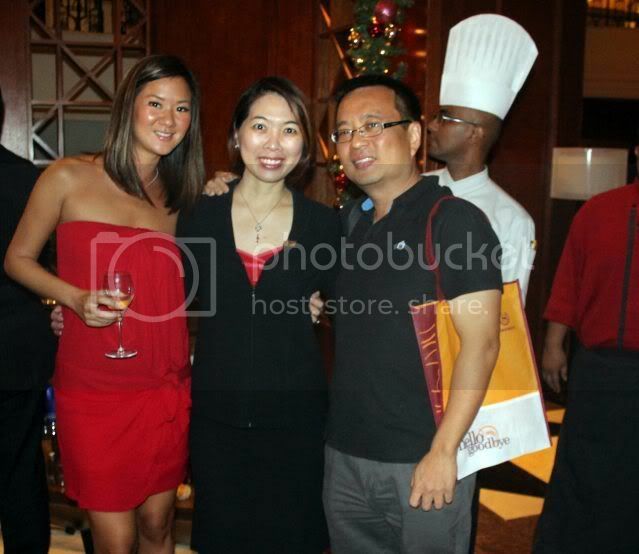 Ciki, Cindy Yoong and me partaking in the Christmas goodies and wine. I remember in the days of yore, when Japanese food was something so rare and exotic, it was the purview of only the wealthy, one of the names that was quintessentially Japanese was Kampachi. 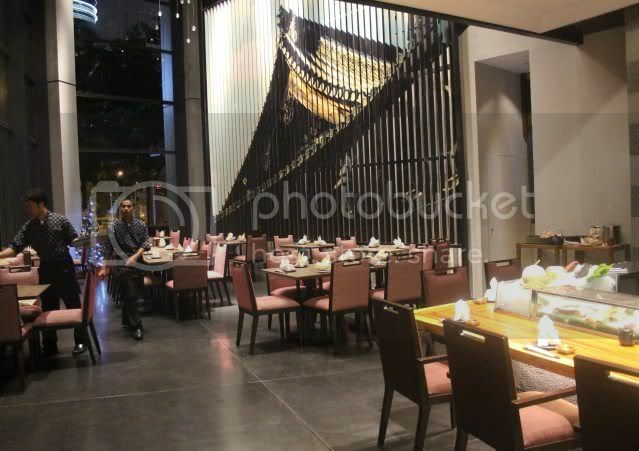 Their famous buffet was the golden standard for Japanese buffets, when such form of culinary indulgence became the in thing, and it was also synonymous with Japanese fine dining, where we hear tales of rich tycoons spending in the tens of thousands on the freshest of sashimis and the best of sakes. And then, Equatorial, that grand old dame, closed its doors to the public, I think sometime at the end of March this year, for an undisclosed period for rebuilding. With it, the iconic Chalet, Kampachi and Golden Phoenix also went into hibernation or so I thought. 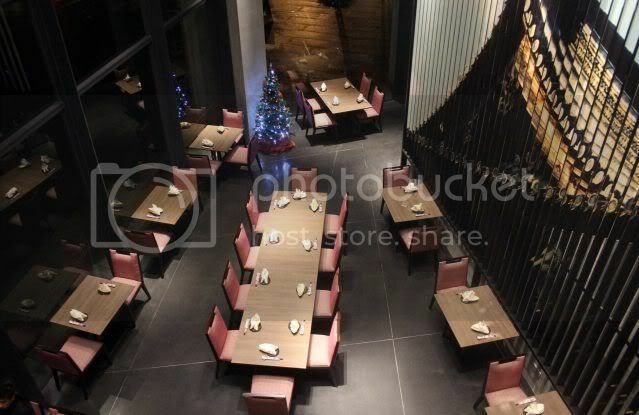 So when Alice Yong, food guru from Jom Makan asked if I would like to try Kampachi's new outlet at The Troika, of course I jumped shamelessly at the opportunity, even if it meant having to brave prime time traffic in KL. The seasonal Omakase Sashimi, a selection of raw fish, with that Toro to die for. I swear, that tuna must be a kobe cow disguising as a fish. Melt in the mouth goodness, (or maybe the kobe cows are fish disguised as cows), and freshness that makes you wonder how long ago they were still in school. A platter like this costs RM400. 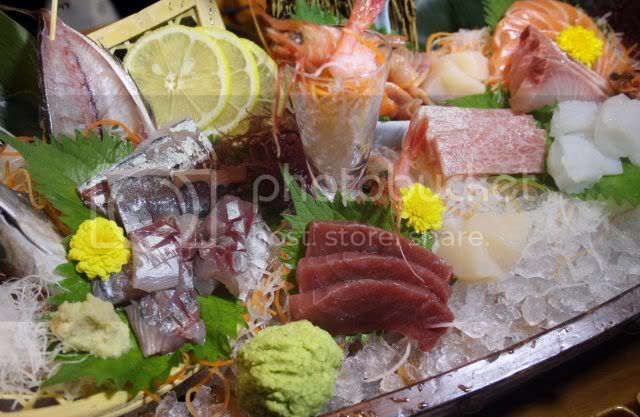 However, before you keel over from a heart attack, (that's why you should eat more sashimi, all that omega oils, I felt healthy almost immediately after eating this platter), you'll be glad to know that Kampachi does have a wide and affordable range of foods.,w ith sets from RM72. The Omasakes range from RM185-RM300. Karashi Renkon - Japanese Lotus Root with Mustard. Rather unique, not something I can say I've had before. 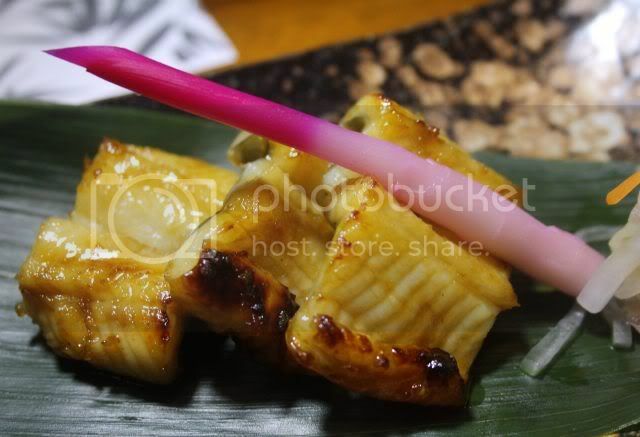 Ogon Anago Kabayaki - Grilled Deep Sea Conger Pike with Sauce. According to the Chef, it's some kind of eel. Heck, how will I ever unagi again after trying this! 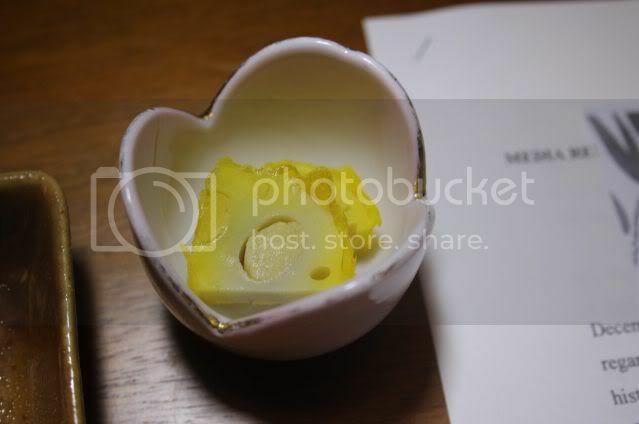 It was really a well eeled dish. Tender, yet firm, and a very lovely flavour that my limited vocabulary cannot describe. Their signature pink ginger embellishes the dish aesthetically, but is also lovely to munch on, if you like pickled stuff. Kinti Nitsuke - Simmered winter season rock fish in seasoning, from the North of Suruga Bay. I find it utmostly difficult to take pictures of whole fish on plates, because the fish look so ...err...dead. 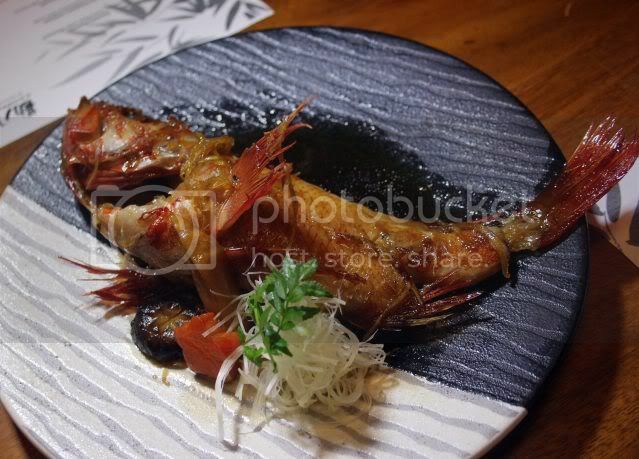 As a scuba diver, of course everytime these marine creatures are served, I wonder what they look like in the sea. Rockfish, as I know it, look like rocks, and it takes a trained eye to spot one, in the water, as they are perfectly camouflaged with their surroundings. And they're really hideous. But as cliche as it may sound, one certainly cannot judge a book by its cover, because if this is that same type of fish, the flesh, ooooh lala, sublime. Fresh and firm, and so clean and pure tasting. Absolutely gorgeous. Which Japanese meal is complete without a nice cut of beef? 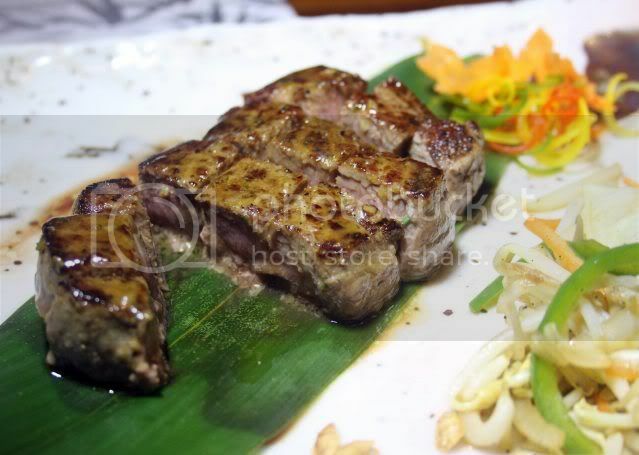 Teppenyaki Tenderloin, seared to perfection, served with Kampachi Truffle and ginger sauce. I could easily have the whole slice myself. Beef seems to be a big thing in Japanese cuisine, which makes me conclude that Shinto-ism must be quite different from Buddhism since a lot of practitioners of the latter do not feature beef in their diets. 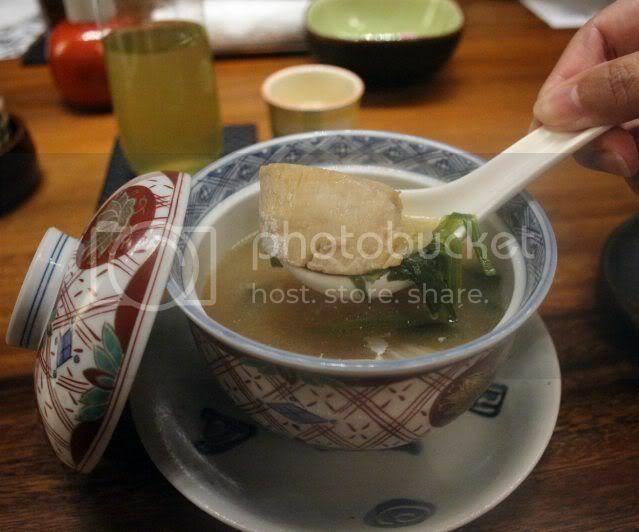 Hamachi Jiru - Yellow Tail fish head in special miso soup. The broth is totally wholesome, and so flavourful, without that commercial miso taste that makes you want to drink 3 litres of ocha after. The fish meat is still delicious, despite it being the base for the broth. And Kampachi garlic friend rice. A perfect cap to a wonderful meal. Actually, even with just the fried rice and the soup, I'd have been happy. I am but a simple man, afterall. Japanese Melon and Kinkan. Now, brace yourself, I myself nearly choked. 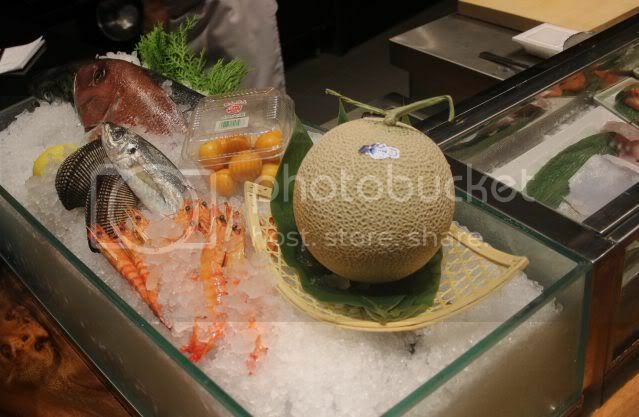 One slice of this melon is RM75, and each kumquat is RM19. 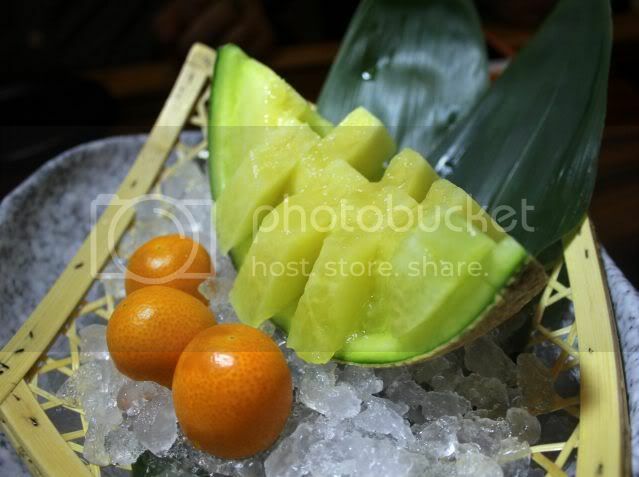 Now, the melon IS very fragrant and sweet, but honestly, for me personally, I would rather eat toro for the same price. At least people had to risk their lives catching the fish. And them kumquats, well, they were good, but I can't tell between a Japanese kumquat or Chinese one. They all look round and orange to me. Obviously I'm a food plebian. 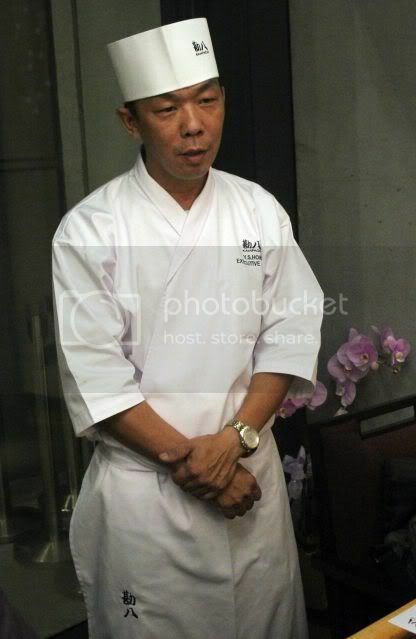 Chef YS How, Executive Chef of Kampachi who's been with them since time immemorial, explaining to us some of the dishes. 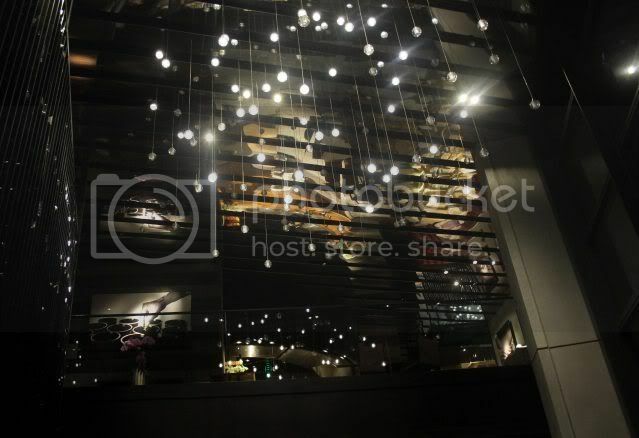 The chic restaurant is "ensconced in a primer corner lot with a highly visible street facade at the luxurious property (Troika) designed by "starchitect" Sir Norman Foster". 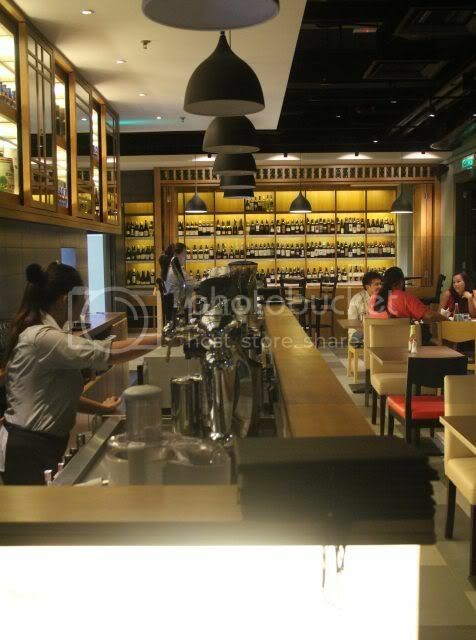 Seating capacity is 118, and tghere is a sushi counter on the ground floor and teppanyaki counter (under construction) on the mezzanine. Fans of the Kampachi buffet will be glad to know that it will be making a comeback in January. Sunday : 11 am - 3pm and 6pm to 11pm. 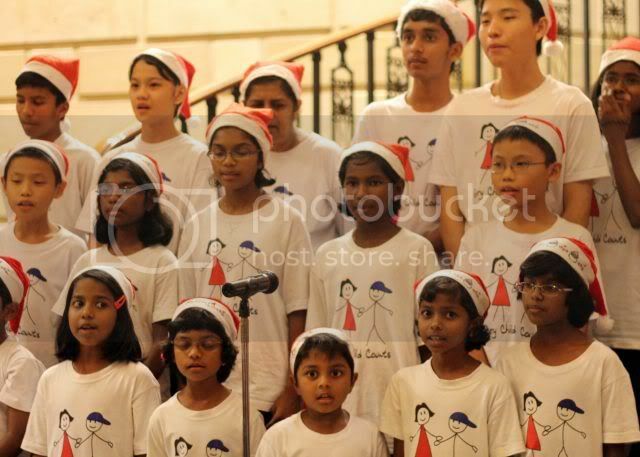 For more information, call Ms Carine Lee at 03-2275 7846. 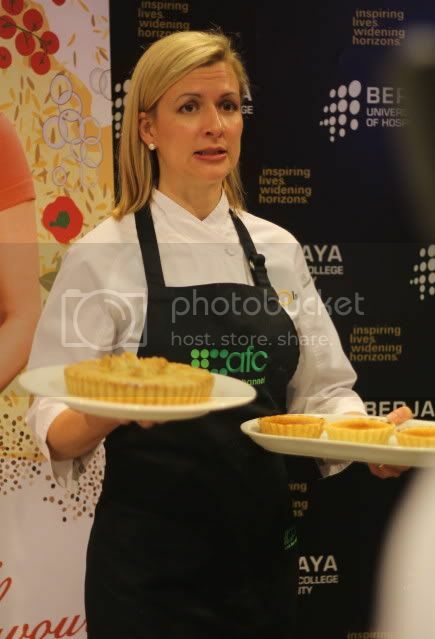 Back in the day when I had the luxury of watching lots of TV, and when it wasn't raining daily day in day out, and our dear satellite service wasn't constantly interrupted because of the rain, I used to religiously follow several cooking shows, and one of my favourites was Sugar, by Anna Olson. She's somewhat of a MILTFW...(Mother I'd like to be friends with)...And a few years ago, I was excited as a zitty teenager on a first date (though I was never a zitty teenager, which alas, I can't say the same for my son), when I heard that Ms Olson was going to be in town. In that first close encounter, I actually got to watch her demos TWICE. Lucky me. So when the PR Company, Alice George sent out invites for yet anna-ther chance to meet with Anna, I was delighted, although debilitated by a violent stomach flu courtesy of my Beijing trip, I braved the rains, and the hoi polloi to board the monorail to Time Square, to head to the Berjaya University College of Hospitality, where the Asian Food Channel was presenting - FRESH FLAVOURS WITH ANNA OLSON. 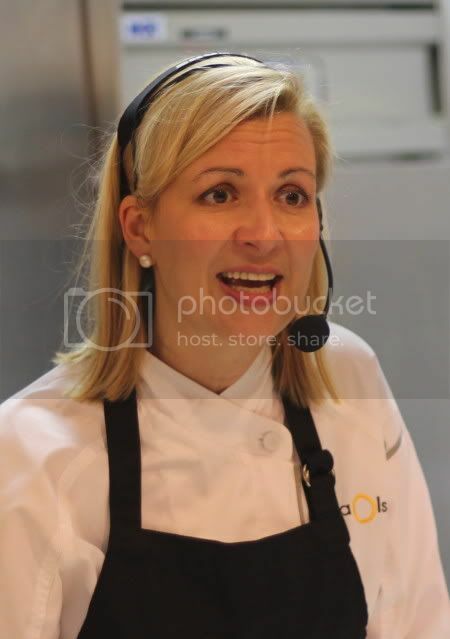 Anna gives a warm wave to the audience, as her husband, Michael Olson gives her a hand in prepping the kitchen. The very popular emcee that requires no introduction, it's just that I am more accustomed to seeing him decked in black, in Hennessy XO Appreciation Grows functions. 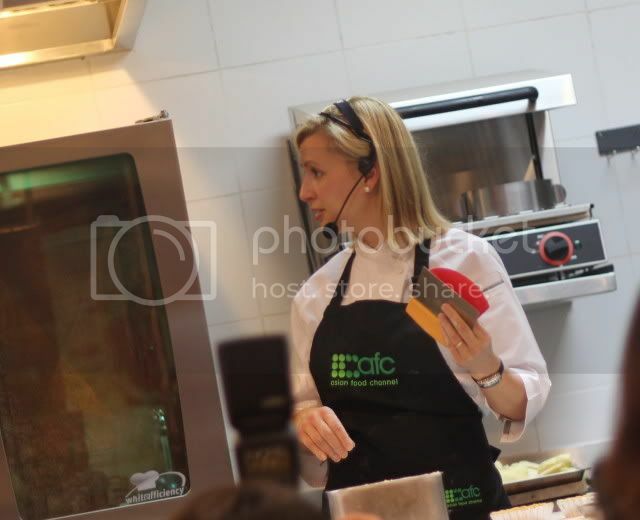 Today, she is demonstrating two recipes, a savoury and an unsavoury one. 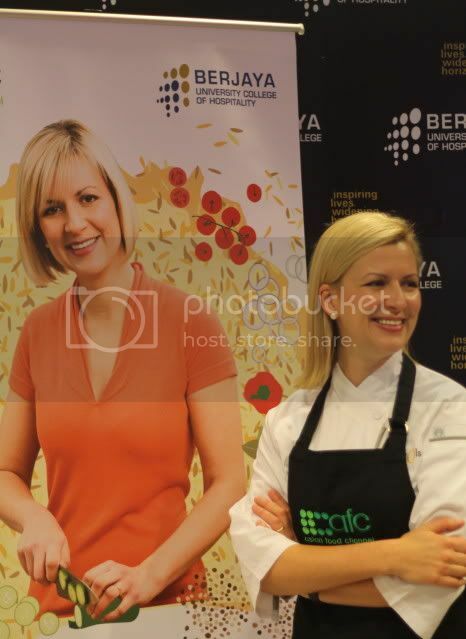 Afterall, she was trained as a savoury Chef, before she turned unsavoury. So she says. She still looks quite savoury to me. 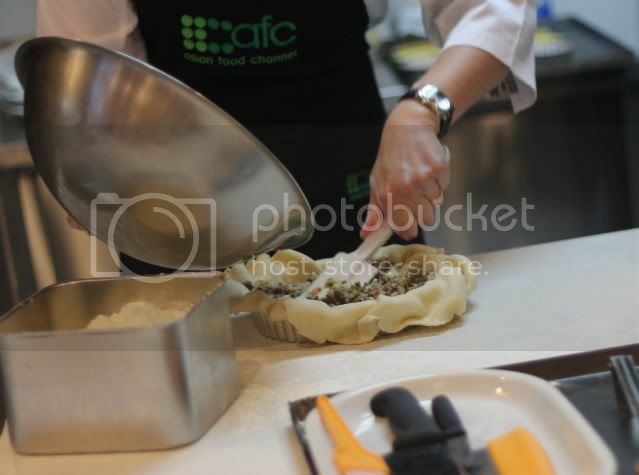 The savoury recipe for the day was the TOURTIERE, (tor-tia), which is basically a meat pie with a glamorous name. 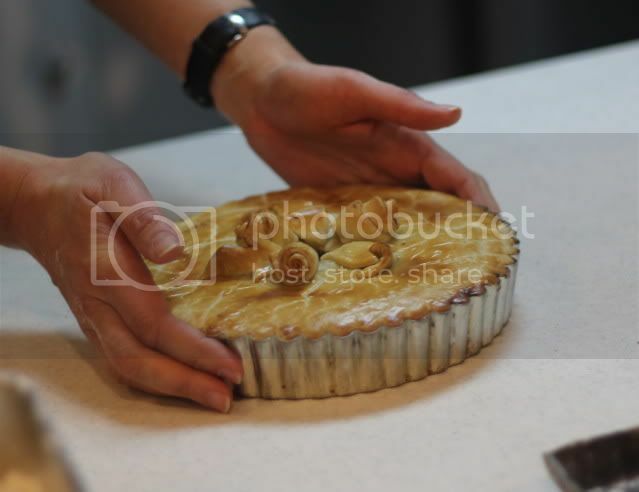 She demonstrates with great ease how to make, and roll a pastry. With the benefit of the magic of television, no sooner had she mixed the dough, miraculously a ready refrigerated one appears. While the apprentice is mixing and stirring the filling, which comprise potatoes, beef & veal, the indispensable trinity called the mirepoix (mir puaaa) which consists of carrots, garlic and onion, pepper, celery seeds, the ALL important ALL SPICE, cider, etc.. The tourtiere is ready to be served. And what a pretty one she is. And such, is the Life of Pie, at least this one, which is bound for fame and glory as the paparazzi shoots it from every conceivable angle. She really is very photogenic, and has a really dazzling infectious smile, that makes her so down to earth despite her celebrity status. These are the two must have kitchen utensils, according to her. One is a metal pastry scraper, for scraping off bits from the work surface, the other a silicone/plastic almost semi circular type scraper, for scraping a mixing bowl, and for reaching into the difficult parts of the bowl where the sun don't shine. 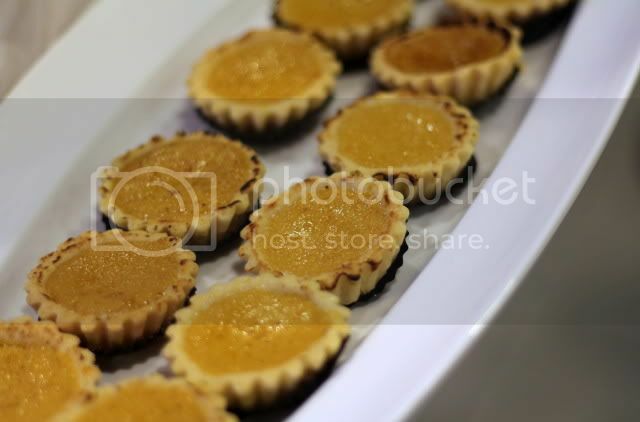 Her next recipe is Pumpkin Creme Brulee, which is actually cross between a creme brulee and a traditional pumpkin pie. The secret to this recipe is the use of cream cheese, instead of cream or milk which is usually used for brulees and pumpkin pies. It requires 6 yolks, so if you are making pavlovas, and bear a heavy yolk, you know what to do with it. 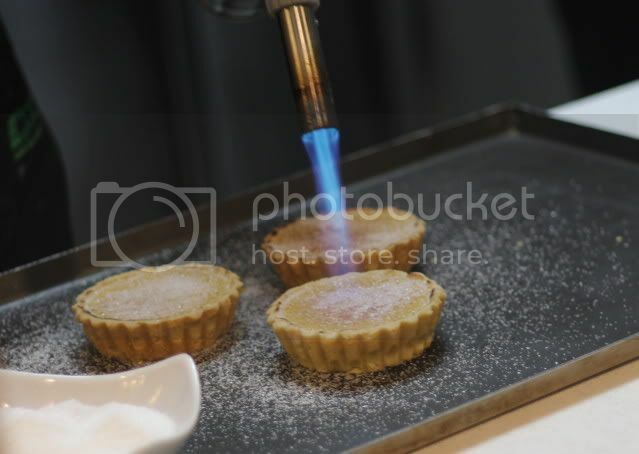 And finally, the creme brulee finish, the caramelizing of the sugar layer on top of the finished tart. There's something unique about wielding a blow torch, it gives one a sense of extreme satisfaction, and power. Burn, SUGAR, burn. Muahahahaha. 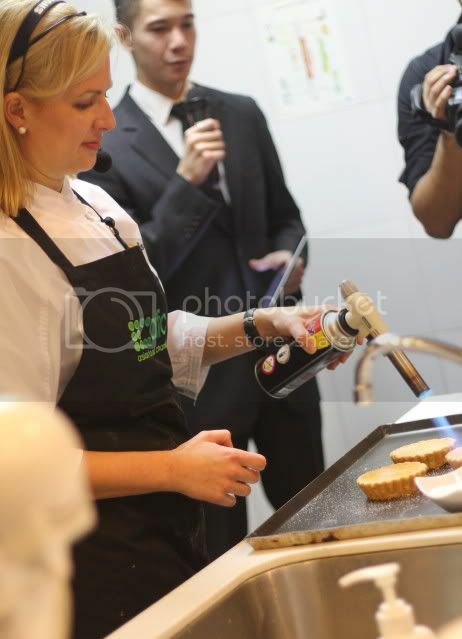 We dont really get to try the product of the master herself, but nevertheless, it tasted good, these miniature tarts. 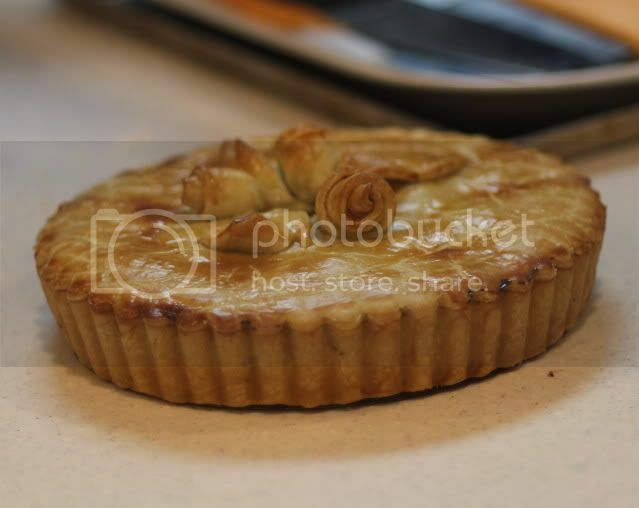 The tourtieres, hmmm....I would have loved to have tasted the original Anna Olson one. Now isn't she such a sweetie, treating the savoury and unsavoury with equal love. seasonal ingredients in her tasty and approachable recipes. herself in Canada’s Niagara region. here where she met her husband, Michael Olson. body to get a delicious end result. step-daughter Mika keeps her young at heart.